Amongst other causes, St Nicholas is the patron saint of seafarers and merchants and seems to be peculiar choice for a village set on gentle uplands with a history of farming. However, St Nicholas was once situated on the Wantsum Channel which, until the 1500s, separated the Isle of Thanet from mainland Kent. The channel was two miles wide and provided a major shipping and trading route between Reculver to the north and Richborough, near Sandwich, to the south. It enabled shipping bound to and from London and the east coast to avoid the treacherous cliffs at North Foreland (between Margate and Broadstairs) onto which many ships were driven when wind and tide combined unfavourably. There were quays along the channel, at Minster, St Nicholas and Sarre. Farmers transported their produce and goods were traded. Over time, the rivers and the port at Sandwich silted up and by the 16th century the channel had disappeared, leaving little more than drainage streams and marshy land which was reclaimed for farming. The parish church of St Nicholas at Wade was built in the 13th century with the first rector recorded in 1294. Of course, I can’t speak for what the church was like before its restoration, and clearly more work has been done since 1876, but when I visited in the spring of 2013 I found a most delightful church. I forgot that it was an Emptage brass memorial and so my initial move was to look for Emptages on the memorial stones on the walls. Disappointed when I could not find any, I then discovered that there was not one but four brass memorials let into the floor and I had been walking over them. 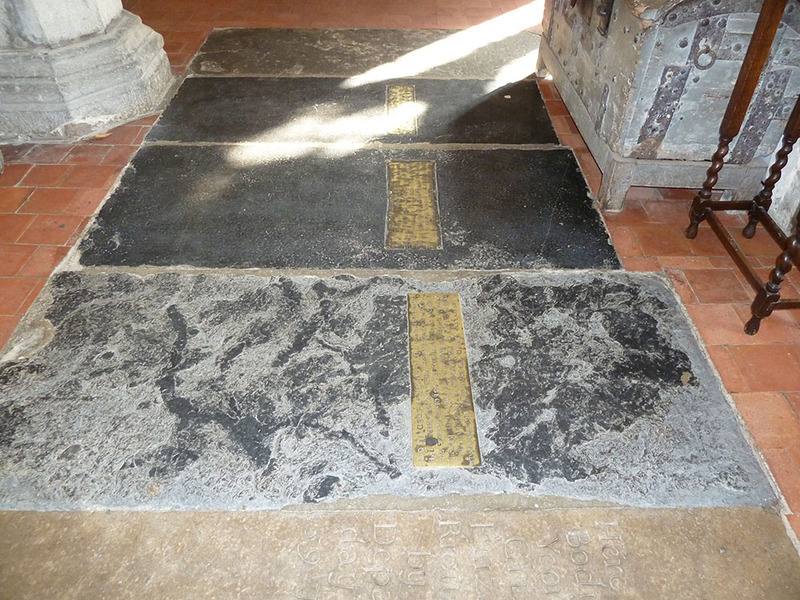 When people are buried in the floor of a church they, or rather, their descendants will expect them to be walked over, as people have been doing for hundreds of years but it still seemed somewhat discourteous and I found myself apologising to the Emptage ancestors. In 1537, when Thomas Cromwell issued the injunction that parish registers of baptisms, marriages and burials were to be kept, he said that they were to be kept in a ‘sure coffer’ with two locks and keys. 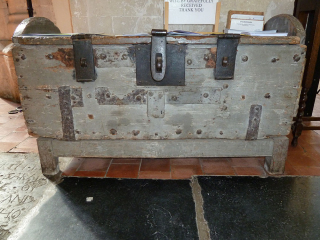 This meant a sturdy chest which would not only keep the parish registers and other documents secure but preserve them from the ravages of mice, damp and mould. So I was delighted to find the parish chest for St Nicholas right by the memorial stones. Unfortunately, though it appears sturdy, it seems that its protection of the parish registers was not so great and several either did not survive over the centuries or were lost. On a hot spring day, the small grassed graveyard attached to the church was delightful, with primroses growing amongst the graves but the stones were so weathered it was impossible, on a short visit, to find any Emptages. This branch of the Emptage family started with, or at least the tree starts with, Richard Emptage who married Joan [Jone/Johan] Allyne in 1565 in St John the Baptist Church in Margate. See the tree here. 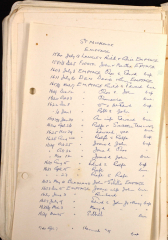 Richard and Joan married in Margate soon after parish registers began there and so we are lucky to have the record but not so lucky in finding the baptisms of their children as the first registers available for St Peter began some 20 years later. However, we do know the children’s names as Richard’s will, dated 1567, named his wife as Johan and his children as Thomas, Edward and Alice. He referred to the possibility that Johan was pregnant at that date and so she was, with Martha. The ancient style of writing and language makes the will one of the most difficult to read in our Wills Project and we need to have it professionally transcribed but it is clear that Richard owned land which he bequeathed to his sons Thomas and Edward. The year of Richard’s death isn’t known, only that Joan, then a widow, married John Sackett in 1571 at St Peters. With a young family to care for it is quite possible that Joan married very soon after Richard died, as was the custom. So from John’s will, we know that by 1588, Edward had not yet reached 21. And that Alice and Martha were both married, as confirmed by the parish register: Alice to Richard Langley in 1584 and Martha to John Fuorte in 1587. Frustratingly, there is no mention of Richard and Johan’s son, Thomas. Why not? Was he still alive? What were his circumstances? Richard had left his land to Thomas and Edward between them so did John Sackett consider that Thomas was already provided for… but wouldn’t that also apply to Edward? So, at the moment, we know nothing about Richard’s son Thomas other than that he was born in or before 1567 and that in his will, Richard named his sons as Thomas and Edward, perhaps indicating that Thomas was the eldest. Thomas was a name which appeared regularly in the Emptage family baptisms and marriages but whether we will find anything which can identify or connect with this Thomas remains to be seen. Following John Sackett’s death, Joan married again, to Richard Knowler and thus Sackett’s farm reverted to her son Edward Emptage. In 1565, when Joan Allyne married Richard Emptage, the parish register recorded her name as Jone and her husband’s name as Emptage. In his and John Sackett’s wills, her name was spelt Johan. 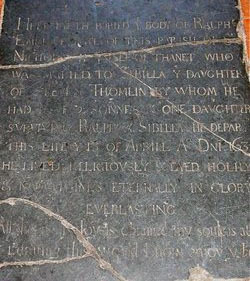 On her memorial stone, her name was spelt both Jhone and Jone and her late husband’s name as Emtage. So the stone is a prime example of the difficulties we face when searching for people in the days before standardised spelling. Edward Emptadge [sic] married Joan Terry in St Martin’s, Herne, by licence in 1591. The bondsmen were John Terry of Herne and Richard Knowler of Hoath, both yeomen. Joan’s father, John Terry, named Edward and Joan’s children in his will dated 1615: Richard, Edward, Mary, Ralph and Thomas. He left them each 40 shillings to be given to them when they reached the age of 21. Interestingly, he left his grandchildren by his daughter Kath £10 each and to other grandchildren he left £39 or £40. Was the disparity between the bequests to the Emptage grandchildren and the other grandchildren a sign of wealth already in the Emptage family? Joan died in 1608 and Edward married Ann Sims [Symes] in 1610 at St Brides, Fleet Street, London. Edward appears to have been a yeoman of substantial means, not only having lands in St Nicholas at Wade but also, with David Denne, a share of a lease on land in the parish of Littlebourne. He was also a church warden. The parish of St Nicholas was tied to that of Reculver and, from the time of Henry VIII, had to pay the ‘mother’ church an annual ‘token’ payment of 3 shillings and 4 pence towards the reparation of the church there. 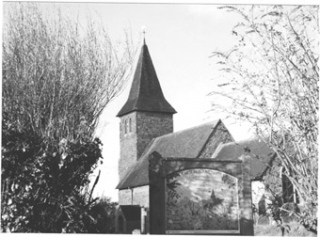 However the Reculver parish was declining and the St Nicholas parishioners resented having to pay the money, especially since their own church needed repairs. In 1617, when the Archdeacon of Canterbury held his ecclesiastical court in St Nicholas, the Reculver churchwardens accused their counterparts at St Nicholas, Joel Solly and Edward Emptage, of not paying the money. The outcome of the dispute is not known but nothing was solved as it blew up again in 1640. When Edward died in 1625, his will named Edward, Ralph and Thomas but not Mary. It may be that she had married or, like Richard jnr, she had pre-deceased her father. Unfortunately, due to the number of missing parish registers, we only know the baptism date of one of the children. Richard was born c1594. A yeoman of St Nicholas at Wade, he married Mary Knowler of Herne in 1617 at Reculver. The bondsmen were his father Edward of St Nicholas and Mary’s father Robert Knowler of Herne, both yeomen. Soon after the marriage, Richard died and was buried on 17 March 1617, aged 22 years, 5 months and 7 days, without having children. Edward matriculated from St Alban Hall, Oxford, on 13 October 1615, aged 15. The Oxford University Alumni, 1500-1886, describes him as a gent from Kent. He obtained a BA from Corpus Christi College on 19 June 1618 and an MA from St Alban Hall on 14 June 1621. Two of his children were born whilst he was still in Oxford: Edward in 1619 and Charles in 1621 but, sadly, Charles died the same year. The Clergy of the Church of England database records that, on 28 September 1622, Edward was appointed curate in the parish of Egerton (between Ashford and Maidstone). He was ordained by the Bishop of London in 1623. From 1628 to 1642 he was the vicar of Postling in Kent (some 24 miles from St Nicholas at Wade). In 1630 he became the curate of Stanford chapel, Lyminge (two miles away) as well as the vicar of Postling. Edward was a Perpetual Vicar, meaning that he received a cash stipend rather than a proportion of the local tithes. William was born in 1622 at St Nicholas at Wade, his father being named as Mr Edward, the title to which he was entitled by his priesthood. Two more sons followed by Edward’s first wife, Susanna: Thomas born between 1623 and 1627 (though a baptism record hasn’t been found yet) and John born in 1628 at Postling. Susanna died in 1632 and, with young children to care for, Edward married Amy Plummer at Stanford the same year. They had five children between 1634 and 1638: Mary, Richard, James, Amy and Nicholas. Amy and Nicholas appear to have been twins as they were both baptised on 5 December 1638. They and their mother died within days, with Edward’s wife Amy being buried on 14 December, Nicholas on 17 December and Edward’s daughter Amy on 29 December 1638. Richard died in 1640. As yet, there appears no further record of James. In 1643 Edward married Mary Hawtry, a vicar’s widow, by which time James, the youngest of his surviving children, was six or seven. All four of Edward and Susanna’s sons remained within a few miles of Postling, in the villages of Stowting, Crundale and Elham, marrying and having children. Ralph was 20, a yeoman, when he married Sibella Tomlin, who was three years older, in St Nicholas in 1624 and had two sons, Ralph in 1628, Edward in 1630 and a daughter, Sibbill, who died in 1639. Ralph senior died and was buried on 15 April 1631. The memorial says that Ralph “lived religiously and dyed holily & now lives eternally in glory everlasting”. It says that all three children survived him but we know that his son Ralph died and was buried just a week later. In his will, Ralph named the children of his brother Edward as Edward, William, Thomas and John. Ralph’s widow Sibilla married John Blaxland, a yeoman, in 1632. Thomas was baptised in 1603 (the first Emptage baptism in the surviving registers for St Nicholas at Wade). He married Agnes Archer in St Nicholas in 1627 and had a daughter Jane in 1629. However, the register for 1627/8 is missing, so Thomas may have had a child during that year. Mary was named in the will of her grandfather, John Terry, in 1615 but there was no mention of her in her father’s will in 1625. Had she, like her brother Richard, pre-deceased her father or had she married and so no bequest was made to her, like her sister Martha? There is no likely marriage for her in St Nicholas nor in another parish so perhaps her death or marriage occurred during the time of the missing parish registers. Presumably Martha was named after Edward’s sister and certainly her marriage year is close to that of her brother Richard. But Edward’s will was written in 1625 and made no mention of Martha, nor did the will of Joan Terry’s father ten years earlier, in 1615, though he left bequests to Edward and Joan’s named sons. 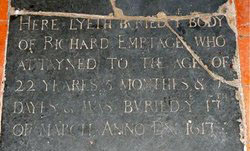 Joan’s Memorial Inscription records that she had six sons and two daughters. We assume these were Richard, Edward, Ralph, Thomas, Mary and Martha and that there were two other sons who quite possibly died in infancy. The next Emptage baptism in St Nicholas after 1603 was in 1619. This was for another Thomas, the son of John. Because of various wills, we have been able to identify Richard and Joan’s children, grandchildren and their great grandchildren through their son Edward. No John is mentioned so who he was and where he came from remains to be determined. To have had a child in 1619 implies that he was of the same generation as Richard and Joan’s grandchildren. Could he have been their cousin, perhaps born around the late 1590s? Could John have been a son of Edward’s brother Thomas? Well, of course he could have been, might very well have been, but proving it is another matter. Such are the frustrations of the family historian, especially when there are parish registers missing! 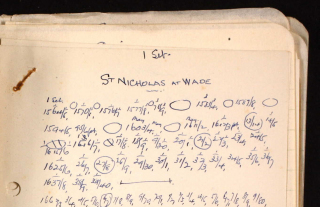 There are no parish register images for St Nicholas at Wade online but we have the notebooks kept by Frank Watt Tyler, a keen genealogist. He compiled hundreds of such notebooks, covering the parish registers in East Kent. They are held by the Institute of Heraldic and Genealogical Studies and are available on Ancestry.com as the Tyler Index. Tyler transcribed the registers by parish and by surname, hence we can see at a glance the entries for the Emptages. Tyler also listed the dates of the parish registers. It seems that he used a large wide O to indicate gaps of several years between registers, and circled a year if it was the only one missing. Unfortunately, there are no registers for St Nicholas at Wade for the years between 1596 and 1603. There is a register for 1603/04, but then no more until 1611/12. 1613/14 appears to be missing, but 1614/15 survived. Above the year 1615/16 he drew a circle with \\ inside it, and a circle with an \ between 1616/17 and 1617/18. I cannot work out what those symbols mean but I wonder if they are indications that the registers were part damaged. It is clear that the years 1621/22 and 1627/28 were missing. All of this means that there were missing (or damaged) registers during a period crucial to the history of the Emptages in St Nicholas at Wade. From 1619 to 1639, there were nine baptisms but with 1621/22 and 1627/28 missing, we have to be aware that there may have been more. John, who had Thomas baptised in 1619, Robert in 1622 and Joane, baptised and buried in 1629. John Jnr had Edward baptised in 1637 and Mary in 1639. With the father of Edward and Mary named as John Jnr, it seems to indicate that John, who had Thomas, Robert and Joan between 1619 and 1629, also had a son who he named John, either in St Nicholas during those missing register years or elsewhere. From the baptism registers it is clear that, in the early 1600s, there were two Emptage families in St Nicholas at Wade. We know that Richard and Joan had two sons: Thomas and Edward and that Edward had four sons who survived to adulthood: Richard, Edward, Ralph and Thomas, as identified above. But what about Richard and Joan’s other son, Thomas? As with his brother Edward, we only know that he was born before Richard wrote his will in 1567 and, because Richard named them as Thomas and Edward, we might assume that Thomas was the eldest. However, as Richard and Joan hadn’t been married very long by 1567, it would seem that all four children were born very close together. Perhaps two of them were twins? Edward married in 1591 and, if Thomas was older, we might assume that he married before or around the same time. Unfortunately there is a gap between the parish registers of 1583/84 and 1587/88 and between then and 1594/95 so it is impossible to know if he married in St Nicholas. However, let’s consider that the bride may not have been from St Nicholas and, as marriages traditionally took place in the bride’s parish, let us look further afield. Presumably we can ignore the marriage in 1577 in St Peter as being too early but what about Thomas Emptage marrying Oby Brenchley in Wormshill in 1588? This was 2/3 years before Richard married Joan Allyne. The parish register of St Peter records the baptism of their son John in 1589 and the family continued to live in the parish. Thomas and Obeiah died within six months of each other in 1627 in St Peter. Thomas’ will names his wife Obie and his sons as John, Daniel, Thomas and Jeffery. He determined that, should his wife die, all his land and tenements in the parishes of St Peter and St John be divided between his sons equally. Also, he referred to eight acres of land which he had bought and that they should have two acres each but, unfortunately, we cannot read the name of the place. It looks like a parish beginning with St and with two words following. It clearly isn’t St Peter or St John nor, as much as I try, do I think that it says St Nicholas AtWade (as it was then written). However, there was another Thomas in St Peter. We know from the 1573 Grant of Administration of the estate of a Thomas Emptage of St Peter, that he had a son named Thomas, age unknown. Perhaps he was the one who married in 1577. The next marriage of a Thomas was in 1614, in St Lawrence, to Margaret Saunders, which seems too late for our purposes. Unless there was a marriage for Thomas recorded in the missing registers, the marriage to Obeiah Brenchley seems the most reasonable choice. Richard had left land in St Peter and St John to be shared by Thomas and Edward equally. It would seem logical that Thomas moved there whilst Edward farmed the land left to him by John Sacket (after his mother Johan had remarried). We know that Thomas and Obeiah had a son, John, baptised in St Peter in 1589. We know the names of all his surviving children from his will in 1627: John, Daniel, Jeffery, Thomas and Godlie. In 1628, John Emptage of St Nicholas and Thomas Emptage of St Peter, both yeomen, were bondsmen at the marriage in Canterbury of Daniel Emptage, aged about 30, to Agnes Deverson of St Lawrence. They may have been cousins but it does seem pretty safe to assume that all three were the sons of Thomas and Obeiah. They moved to St Nicholas at Wade where they had Thomas, baptised in 1619 (named after John’s father? ), Robert in 1622 and Joane in 1629 (who died the same year). Presumably Joane was named after her mother. Joane, wife of John was buried in St Nicholas in December 1633. If John was between 20 and 30 when he married Joanna Wheatlye, he would have been between 39 and 49 when she died. His daughter Joane had died but his sons Thomas and Robert would have been 14 and 11 so it is quite likely that he married again. And it seems John, a yeoman and widower from St Nicholas married Hester Appleton in 1634 in Canterbury. She was widow and, like John, was from St Nicholas. In 1636, a John Emptage married Mary Fuller in Minster. They had two children, Edward in 1637 and Mary in 1639. Their father was named in the baptism register as John Jnr, thus implying that he was the son of John and Joanna Wheatley. If this supposition is correct, Edward and Mary would have been the grandchildren of Thomas, great grandchildren of Richard and Johan. It seems that John’s wife Mary died as, in 1645, John, widower and yeoman, married Martha Peers of Nackington. A third Emptage family in St Nicholas at Wade? In 1556 a John Emptage was living in St Nicholas, with his wife Annys, who was carrying his child. John made his will in March 1556 and made provision for the unborn child. He made a bequest to his father who was living but unfortunately not named in the will. John died between March 1556 and April 1557 when the will was proved. Could he have been a older brother of Richard? Could his unborn child have been a son who survived and, by the early 1600s, have had descendants still living in St Nicholas? 1611: Ann Emptage married David Denn (Tyler says 1611 whilst the Dean and Chapter of Canterbury notes say between 1604 and 1611.) Was Ann a daughter of Thomas, sister of John snr? 1620: Thomasine buried, no parents given so it would seem she was an adult. 1634: Richard buried, no parents given so it would seem he was an adult. 1634: Thomas Emptage, born c1604, husbandmen of St Nicholas, married Mary Goteley at Petham. 1636: Thomas Emptage administered his brother Richard’s estate and drew up the accounts. The names Robert and Gabriel Emptage also appear at the end of the accounts. Richard, grandson of Richard and Joan had died in 1617, so it couldn’t have been his estate which was administered and accounted for by his brother Thomas in 1636. We have nothing to connect Ann, Thomasine, Richard and Thomas with the descendants of Richard and Joan through Edward and Joan Terry or Thomas and Obeiah. And so, in the absence of any other theory, my current thinking is that they were the descendants of John and Annys. 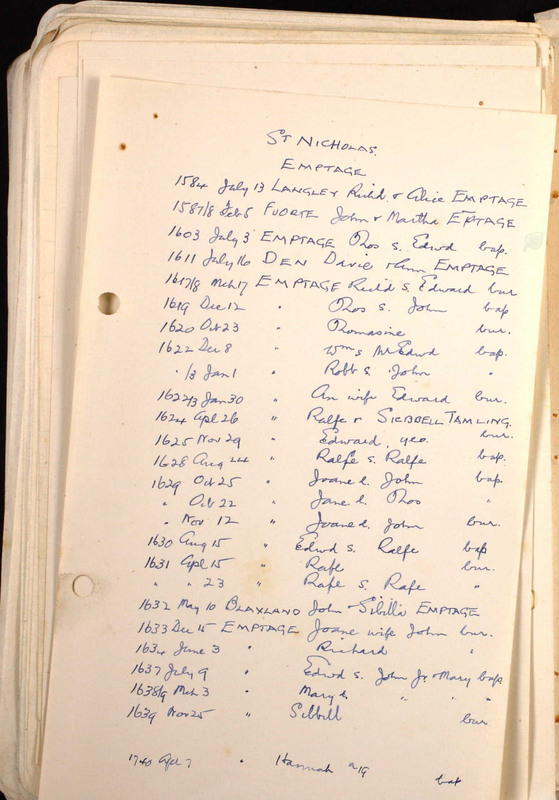 However, it presents us with a problem in that we now have two Thomas Emptage in St Nicholas at the same time, of approximately the same age, who both had brothers named Richard. Thomas, son of Edward the churchwarden was baptised in St Nicholas in 1603 but the registers for the years either side of 1603/4 are missing. Presumably one of those would have contained the baptism records for the other Thomas and his brother Richard. Thomas Emptage, of St Nicholas at Wade, yeoman and bachelor, aged about 23, married Agnes Archer in St Nicholas in 1627. Thomas Emptage, of St Nicholas at Wade, husbandman, bachelor, about 30, married Mary Goteley at Petham in 1634. Clearly there were two Thomases, not one Thomas who became a widower and married again. They were both about the same age, born c1603/04. So which Thomas married Agnes and which one married Mary? Presumably the daughter Jane baptised in St Nicholas in 1629 was the daughter of Thomas and Agnes. I have drawn the tree with Thomas, son of Edward, having married Agnes and with a daughter named Jane because that is how I first connected them some years ago but now that I know of the other Thomas and the other marriage, I cannot, in all honesty, say that was how it was but neither can I say that it wasn’t that way. And I have drawn the tree to represent Thomas, son of Richard and Joan Alleyne, marrying Obediah Brenchley in 1588, together with their descendants. I have no way of including those Emptages who may have been descendants of John and Annys, including the Thomas who married Mary Goteley. However, I have made notes on the tree. As I said earlier, the name Thomas appears regularly in Emptage marriages and baptisms. The repetition of the name across the generations and within the same generation gives family historians nightmares. After the baptisms of Edward and Mary in 1637 and 1639, there were no more Emptage baptisms until Henry, son of John, baptised in 1737. And, in 1740, a baptism of Hannah, aged 19, no parent’s name given (born c1721). Of course, as an adult, we don’t know if she was born in St Nicholas at Wade or had moved there. 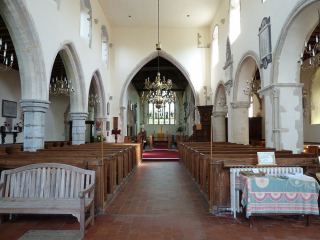 That was the last Emptage baptism in St Nicholas at Wade until 1820. So there is a gap of almost 100 years between Emptage baptisms in St Nicholas at Wade from 1639 to 1737. However, it doesn’t mean that no Emptage children were born there as, during the period of the Civil War and the Commonwealth, 1642 to 1660, across the country records were poorly kept or kept in secret by vicars who did not approve of the new religion, sometimes hidden for safe keeping and therefore sometimes lost or damaged. During this time many Church of England ministers were deposed from their parishes and replaced by Presbyterians and Puritans who would not perform baptisms. A form of civil register was meant to be kept but few seem to have survived. In 1650, the year that Oliver Cromwell vanquished Charles II, the village had a new vicar, Nicholas Chewney. From a pamphlet which he wrote, he appears to have been a ‘hellfire’ type of preacher which fits with the Presbyterian or Puritan way. He was ejected in 1653, reason not known, but resumed in 1658. In 1670 he was called to an appearance before the archdeacon to answer the charge that he had preached just four sermons in the village in as many months. Chewney was also the vicar of St John’s, Margate and, admitting the charge, pleaded that the lack of a vicarage in St Nicholas at Wade handicapped his work. The vicarage had burnt down by 1620 and had not been replaced. There is no indication of where Chewney’s predecessor lived or how he managed. Chewney was also charged with neglecting to bury people, which he denied but it leads us to wonder exactly what happened to those missing registers, at least from 1650 onwards. Did he, whilst accepting payment for the living, simply neglect his duties in St Nicholas to an incredible degree whilst putting his time and energy into St John’s at Margate? As shown earlier, at the front of his section on St Nicholas at Wade, Tyler recorded the dates of the parish registers. They end with 1639/40 and start again with 1662/3. The absence of parish registers for St Nicholas at Wade during the Civil War and the Commonwealth leads us to wonder what was happening in the other Thanet parishes during that difficult period. The ‘Lord General of the Army’ was Oliver Cromwell who was appointed Lord Protector of the Commonwealth in 1653 and set about healing and settling the nation after the chaos of the civil wars, the killing of King Charles I and the parliamentary infighting. It explains some of the difficulties those in the church faced. There is no indication who wrote that passage in the register and, for several pages around that time there was no signature at the bottom of the page verifying the entries. This could mean that they were not written when the ceremonies were performed but were added later and therefore there may be omissions from the registers. 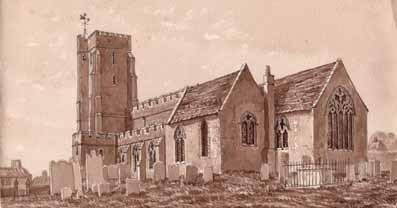 Having checked the baptism registers for the other parishes in Thanet, it seems that they continued through the Civil War and Commonwealth years and that the only parish in Thanet which had interruptions in its registers during those years, 1642 to 1660, was St Nicholas at Wade. Whilst no marriage licences were issued, people could still marry by the calling of banns within the parish but, with no Bishop’s Transcripts, if the register was lost, all records were also lost. Yes, I am thankful for what we do have but, useless as it may be, it doesn’t stop me lamenting the loss of the parish registers through the Civil War and Commonwealth years and the unexplained loss of whole registers before the Civil War. It means there is a gap in the Emptage record, both of the known descendants of Richard and Joan as shown on the tree or of the other Emptage family or families in St Nicholas at Wade before the Civil War. Although Henry’s baptism in 1737 was the first Emptage baptism there since 1639, we must take the Civil War and Commonwealth years out of the equation and thus consider that his was the first Emptage baptism since the registers resumed in 1662. This still leaves a gap of 75 years and we would expect that if there were any Emptages still in St Nicholas at Wade after 1662, they would be listed but there were no entries at all, either for baptisms, marriages or burials. The last two records for St Nicholas at Wade which we have is an inventory for the estate of Ralph Emptage, yeoman, dated 1661 and the marriage of his widow Mary to Stephen Hatcher at St Mary Magdalene, Canterbury in 1665. Both were of the parish of Staple. Unfortunately, we don’t know who that Ralph was. After that, it seems that there were no more Emptages to record; they had died or had moved away. So it is clear that the descendants of Henry and Ann Peal who believe they have traced his ancestors back to St Nicholas at Wade have not done so through any familial connections identified through that parish’s registers. And we must look elsewhere for Henry’s ancestors. This article is the result of intensive research by Mary Clark and Susan Morris and therefore it is a joint effort. However, the words are Susan’s, so any mistakes which it carries are her responsibility. We formed the supposition that Thomas, the son of Richard and Joan Alleyne, was the Thomas who married Obeiah Brenchley in 1588 but, in the absence of the parish registers for St Nicholas at Wade and any other corroborating detail, we feel it is too speculative to be named as an hypothesis. 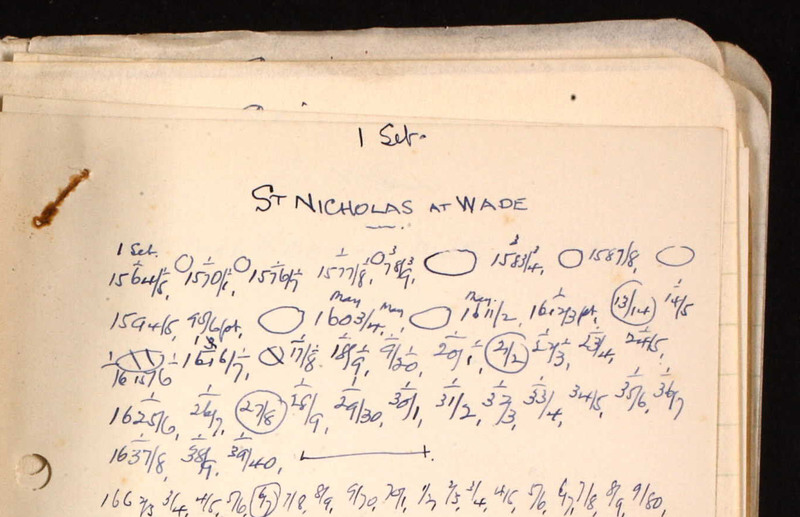 There are twenty records in the National Archives concerning the Emptages of St Nicholas at Wade. Two are at the archives at Kew, one at the Kent History Centre at Maidstone and seventeen in the Canterbury Cathedral Archives. Tim Emptage, our roving archive researcher, plans to visit all the centres soon, delve into the dusty files and return with copies of the documents. The documents are dated between 1598 and 1639. Hopefully, they may have information which will throw light on the queries which writing this article has raised and we’ll be able to update it in due course but, given that the latest is dated 1639, they are unlikely to tell us why there were no Emptages living in St Nicholas at Wade between 1661 and the baptism of Henry in 1737.